This shop has been compensated by Collective Bias, Inc. and its advertiser. All opinions are mine alone. 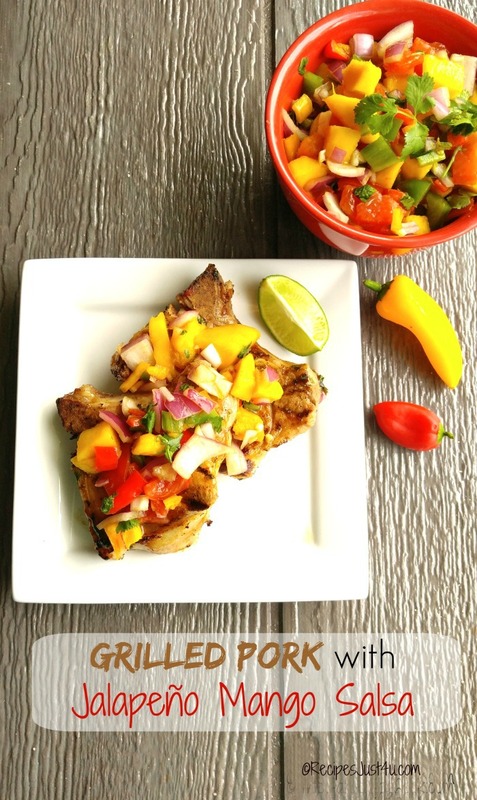 #AllNaturalPork #CollectiveBias It’s time for some grilled pork with mango salsa! We love to grill at our house. My husband is a wonderful grill master, and everything he puts on the grill comes out beautifully. It’s up to me to come up with whatever it is that I hand over to him to cook. Since we grill outside year round, even in the winter, that means a LOT of meal planning. This grilled pork with mango salsa is my latest creation, and I just know we’ll be cooking it over and over again this summer! It’s one of my 30 minute meals and that includes making the salsa too! This grilled pork with mango salsa recipe is the perfect choice for the upcoming grilling season. Richard is very fond of anything spicy. I like a little heat but not too much. So, this means that I have to combine flavors to suit us both. That means that cuminalmost always works its way into my spicy dishes. It has a wonderful smokey flavor that combines with hot peppers and other hot spices, BUT I can tame them down a little by not adding so much of those and still ending up with a delicious recipe. Since I am also a very busy lady, I also love meals that can be made in 30 minutes or less. Everyday easy is my motto, especially when the weather heats up and I just don’t want to be indoors too much. That makes this recipe for grilled pork with mango salsa just perfect. It is super easy to do but tastes like you spent hours on it. Just look at what is going into the marinade for my pork today! I chose Smithfield All Natural Fresh Bone In Pork when I was shopping at my local Walmart. 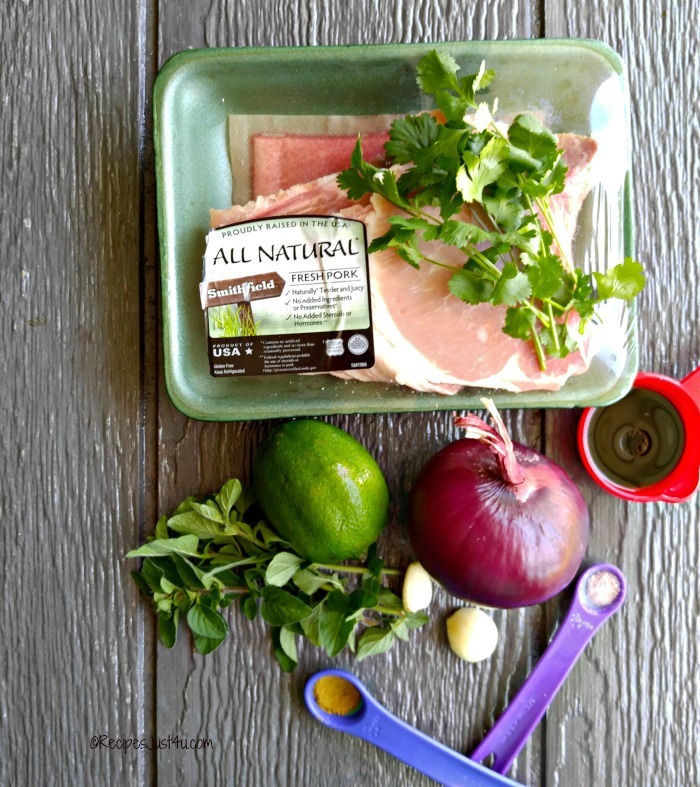 These pork chops are naturally tender and juicy, and there are no added steroids, hormones or artificial ingredients. That makes them better for my family and I love that. Smithfield All Natural Fresh Pork Chops are proudly raised in the USA by Smithfield® farm families. These pork chops can be prepared in a variety of cooking methods, including grilling, roasting or sautéing To learn more about how Smithfield provides quality pork, visit this site. Also, be sure to scroll down to the area of this post just above the recipe card for a chance to win a $100 Walmart Gift card! The first step is to make the marinade and then place the Smithfield All Natural Fresh pork chops in the fridge for about 20 minutes. You will want the flavors to mix well with the meat. 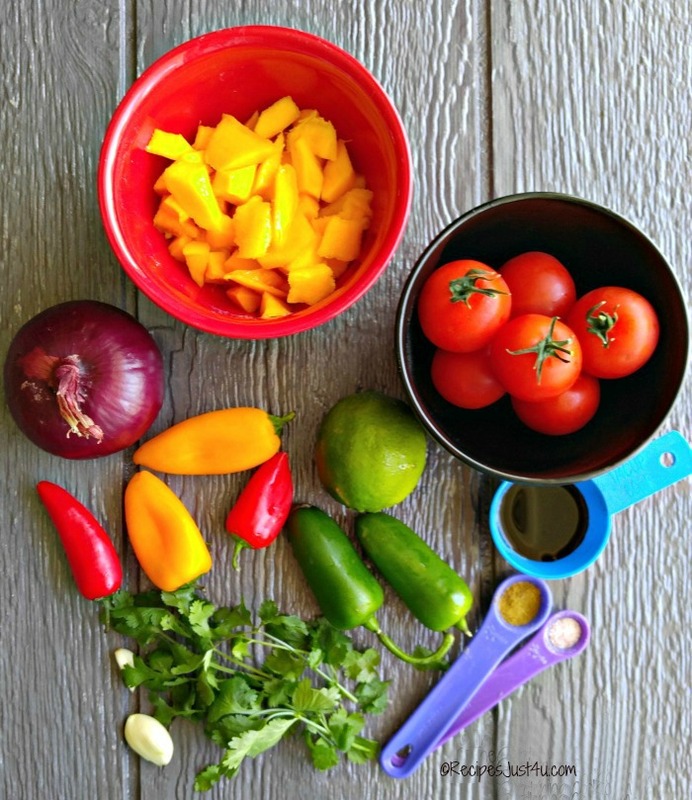 If you have time, longer is even better, but 20 minutes gives you plenty of time to make the homemade mango salsa that will accompany the meat. Look at these colors! We adore salsa, anyway, anyhow, and any day! It is the perfect low calorie snack and is wonderful on all types of protein. Since my marinade for the meat is Mexican inspired, I’ll use some of the same flavors for my salsa, today. The first step in making the salsa is to seed the tomatoes. I chose Campari on the vine tomatoes. They are an easy size to handle. I can hold half a tomato in my left hand and use a spoon to scoop out the seeds in the other. Repeat until they are all seeded. Then give the tomatoes a good dice and combine them with all the other fresh ingredients. Add your lime juice and balsamic vinegar, the super fresh cilantro leaves and cumin and sea salt and give it all a good swirl. 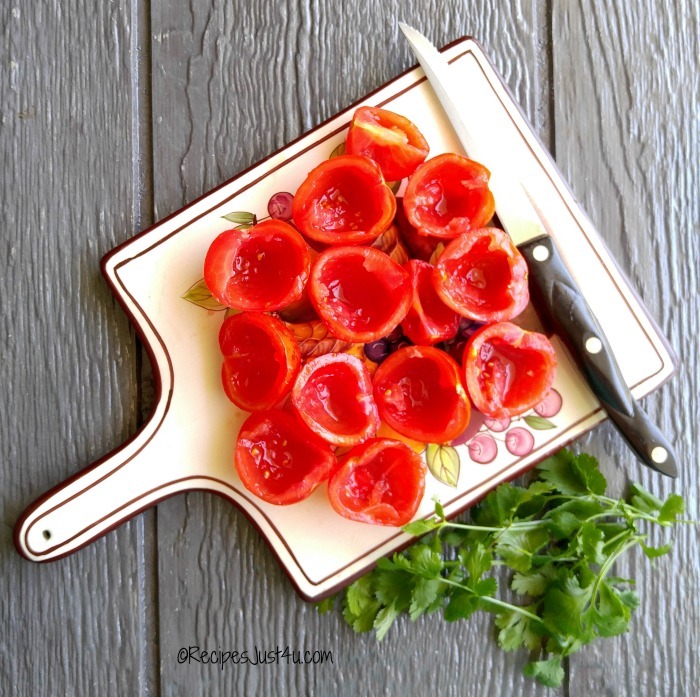 Here is a tip: Roll your lime on the cutting board a few times to release the juices. You’ll get much more juice out of the lime doing this! Now it’s time to grill the pork chops on the BBQ! They need to be done to an internal temperature of 145º. My Smithfield All Natural Fresh pork chops were not too thick and took about 6 minutes for each side. Top them with the fresh homemade mango salsa and be prepared to have a party in your mouth! 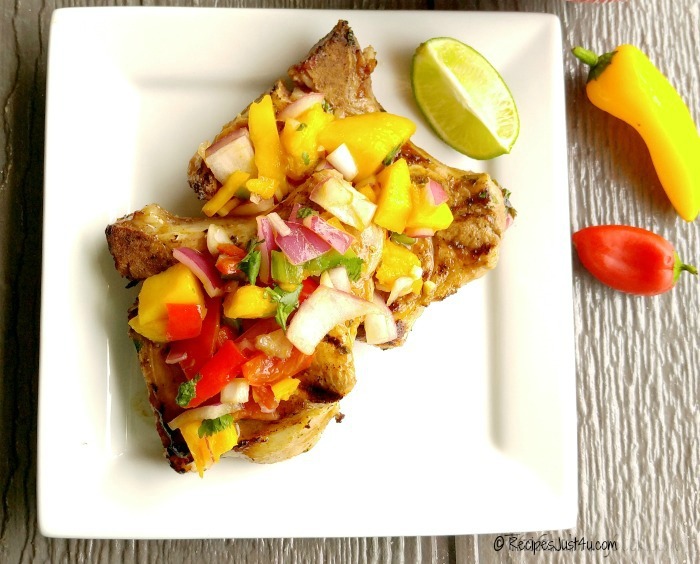 These grilled pork chops with mango salsa are SO GOOD. The salsa has a bit of a kick to it, but is not too spicy and the cilantro and the lime juice combines perfectly to round it out and add a dash of fresh citrus. After tasting this salsa, you won’t want store bought every again. And it’s SO easy to make, there is no reason to buy it. Need a great side dish to go along with your pork chops? Try this Southern coleslaw.The dressing is just amazing! 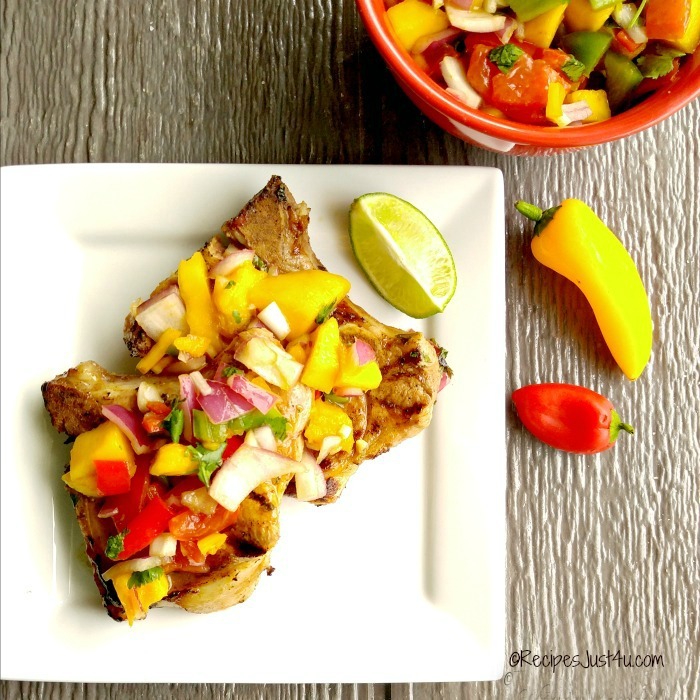 Do you want to make this grilled pork with mango salsa for your family? 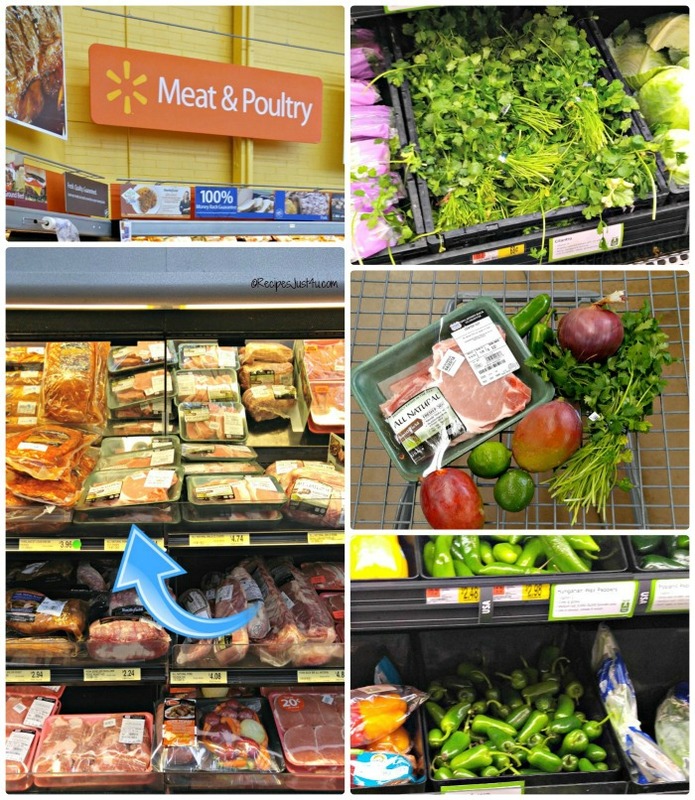 Head on over to Walmart and visit the fresh meat department. You’ll also want to see what they have for fresh produce. I got both jalapeño peppers and mangoes the day I was there! 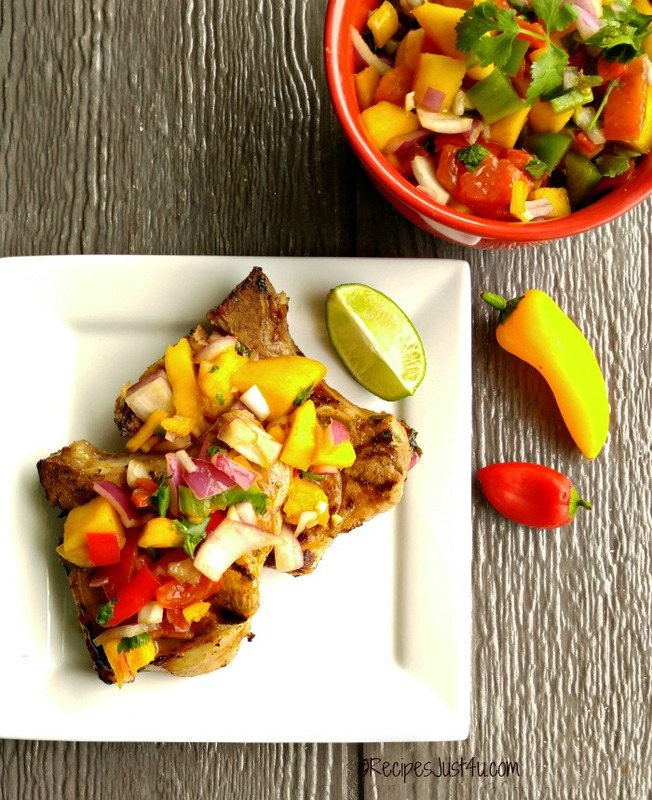 Did you like this recipe for grilled pork with mango salsa? Check out this one in the video below for Maple Chipotle Glazed Pork Chops. I’ll be trying this one next week, for sure! Also be sure to visit this recipe hub for other great ideas to use Smithfield All Natural Fresh Pork. Juice from one large lime. Mix all of the marinade ingredients together in a shallow dish. Coat and place pork chops in marinade, and let sit, covered, in the fridge for at least 20 minutes - the longer the better. (you can even marinate it in the morning and then grill at night if you wish.) Rotate the pork chops occasionally. Remove the pork chops and grill them, either outdoors on a BBQ or inside on a grill pan on the stove. Grill to an internal temperature of 145º. Mine took about 6 minutes per side. 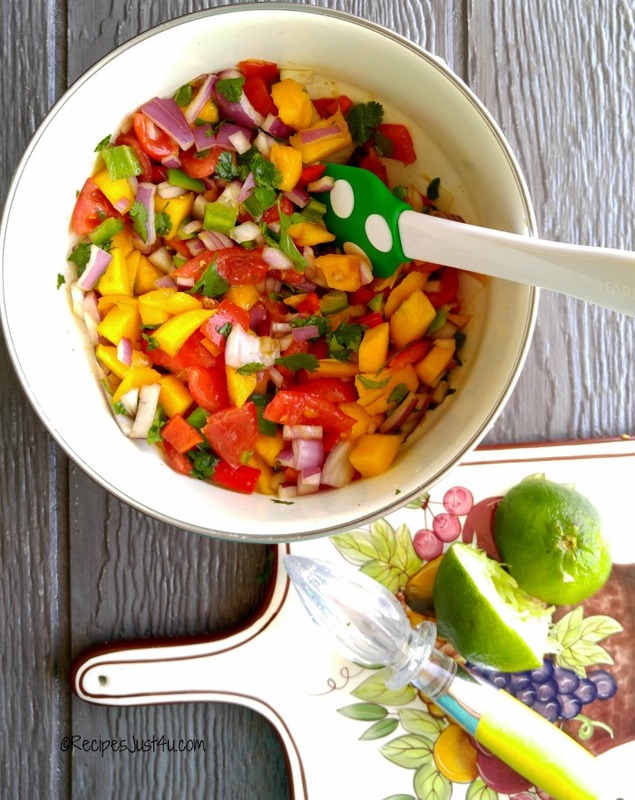 I love the idea of mango salsa! 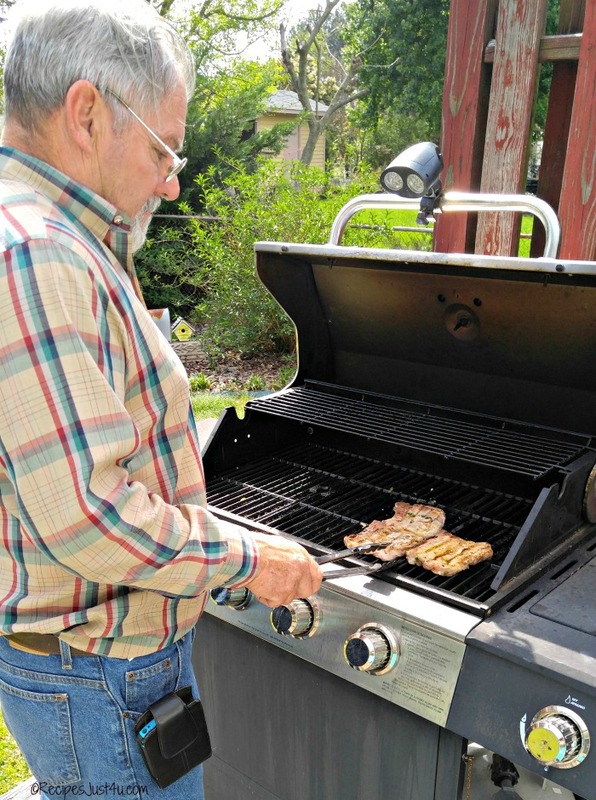 With the price of beef skyrocketing, pork is a great choice for grilling. I’ve made a version of this mango salsa before. Love the hit of jalapeno in your recipe! This looks delicious Carol! I haven’t had grilled pork chops in a long time and the salsa looks amazing. Thanks Linda. Hope you enjoy it. Thanks David. Hope you enjoy it. It was a big hit at our house! Oh, boy. You’ve done it again. I absolutely have to try this recipe. The salsa looks so good. I like anything fresh and homemade…and did I say, easy? Richard adored this one. He is big on salsa!